SAI offer a range of Radial Piston Hydraulic Motors from 40 cc/rev through to 12,000 cc/rev. Gearboxes directly mounted to the motors to optimise power transmission. Wheel Drive units from 60 cc/rev through to 7400 cc/rev with or without brakes. Brakes can be directly mounted to motors or incorporated in Motor/Brake/Gearbox assemblies. 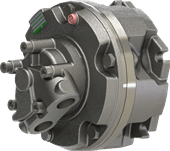 SAI (GB) Limited are the sole UK distributor for the SAI range of crankshaft design radial piston hydraulic motors and ancilliary components including gearboxes and brakes. A quick and personal service. Enquiries are dealt with on receipt and usually quoted the same day. 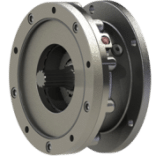 Hydraulic motors that offer great efficiency throughout the normal operating range. SAI have been specialising in manufacturing Hydraulic Motors for over 50 years. SAI Motors drive wheels, conveyors, axles, augers and much more. SAI Motors drive winches, thrusters, hatch covers and much more. SAI Motors drive drilling rigs, road planers, dump trucks and much more. SAI Motors drive tunneling machines, loaders, road headers and much more.